The original all natural egg coloring kit. Just got even better now includes grass growing kit on which to display finished eggs. Fun for the kids, great for our planet. And always delicious to eat eco-eggs coloring dyes are made with natural and organic fruit, plant and vegetable extracts from annatto seed, curcumin, purple sweet potato and red cabbage. 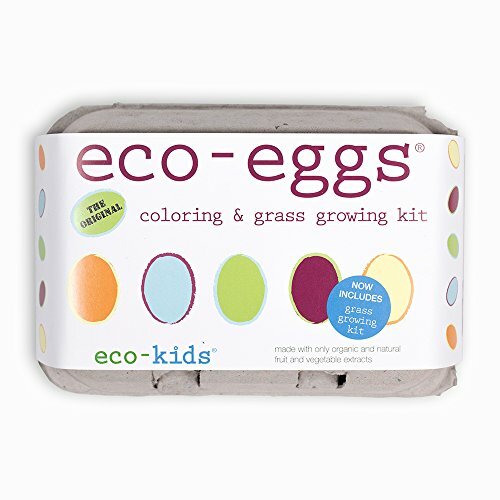 Color eggs the natural way and keep your eggs safe to eat kit includes: 3 powder-based coloring packets made with all natural and organic vegetable & plant extracts with dried vinegar, eco-crayon for decorating eggs prior to dipping, grass seed, 2 eco-coconut husk pucks (just add water to make soil). Plus color chart and instructions. For ages 3+. Non-toxic.